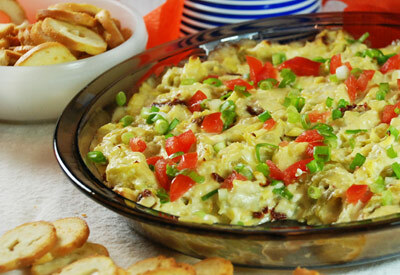 In a bowl, combine artichoke hearts, mayonnaise, cream cheese, Parmesan cheese, green chilies, sundried tomatoes and garlic. Spread into a 9- inch pie plate or 8 x 8 baking dish. Bake for 20 minutes or until top is lightly browned and bubbling. Sprinkle with fresh tomatoes and green onion. Serve immediately with bagel chips, crispy crackers, toasted bread or tortilla chips.